My friends Nicole and Ray prepared the following recipe for this month's Chef Spotlight dinner where we highlighted Spanish chefs and cuisine. The combination of fruit and seafood in this salad is so refreshing and wonderful for summer. A fresh and refreshing salad for the summer, Spanish tomato salad is simple to make. 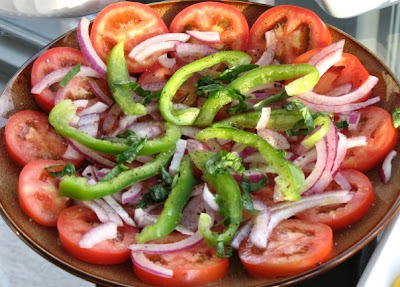 Toss sliced tomatoes, green pepper and onions on a platter and drizzle with extra virgin olive oil and vinegar. Sprinkle with salt and you have a delicious salad. If you want to spice it up, chop a bit of fresh basil and or oregano and sprinkle over the top. This tomato salad recipe makes 4 servings. Rinse tomatoes and cut into slices about 1/4-inch thick. Place on platter or serving dish. Thinly slice red or yellow onion and cut in half. Scatter on top of tomatoes. Cut green bell pepper in half. Remove veins and seeds. Cut into thin strips and scatter on top of tomatoes and onion. Drizzle extra virgin olive oil and red wine vinegar over the top of salad. Sprinkle salt on top. i can't wait till out tomatoes ripen so i can try this!